Dolly Parton’s Imagination Library announced this month that Marion Gillooly has joined the not-for-profit organisation to lead growth initiatives in the UK. The addition comes as the programme celebrates its 10-year anniversary in the UK, which currently gifts books monthly to over 42,000 children in all four nations. Most recently, Marion served as the Head of Strategic Development and Innovation for Includem, a charity organisation headquartered in Glasgow, dedicated to serving children and young people with specialist, relationship-based support. She played a key role in achieving service growth and expanding funding through relationships with independent trusts and foundations in her time at Includem. 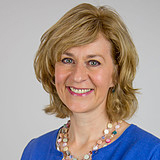 Prior to her work there, Gillooly spent over 12 years in a variety of public sector roles advising and leading children’s and social care sector initiatives. Founded in 1996, Dolly Parton’s Imagination Library is a not-for-profit organisation that gifts over a million books each month by mail to children from birth to age five in participating communities all over the United States, Canada, Austrailia and United Kingdom. The Imagination Library celebrated its 100 millionth book this past March in connection with the Library of Congress in Washington, DC. Promoting the love of early reading and learning as the building blocks for a strong foundation in education, the foundation believes in helping children dream more, learn more, care more and be more through its educational campaign.